Two beach restaurants, swimming pool, sunken bar, sea water sport, free safety box, laundry service, money changer, tour desk, postal service, doctor on call, parking lot, credit card accepted and telecommunication service. Its 17 air-conditioned cottages have private verandas surrounded by colorful tropical flower garden, over looking the sea, and own private bathrooms with cold and hot water. Mini bar, color television and telephone are set up for each room. 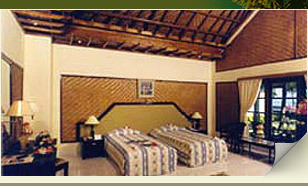 In addition, its 24 Rooms AC superior have hot and cold water, color television, minibar, telephone and private verandah. 22 rooms AC standard have hot and cold water, telephone and private verandah.